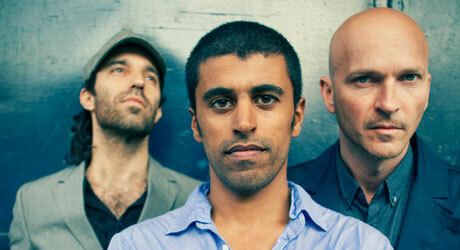 ISRAELI experimental group Balkan Beat Box is bringing its eclectic blend of Middle Eastern-spiced electronica to Australia this month. The band is making its first tour Down Under with concerts in Brisbane, Sydney, Melbourne and in New Zealand. Formed in 2003 by Israelis Tamir Muskat, Tomer Yosef and Ori Kaplan – who MTV has dubbed the “Godfathers of Global Bass” – the three musicians remain the band’s permanent members, while a rotating cast of five to six guest artists complete the ensemble. “We’ve had a Syrian singer, an Iranian, a Moroccan, all of us making music on stage, and that is a message in itself,” says saxophonist Kaplan, speaking by phone from Tel Aviv while relaxing in a trendy café. Having released four studio albums so far, with the most popular being Nu Med in 2007, Balkan Beat Box incorporates a cornucopia of genres and cultures into its punchy, toe-tapping beat. When you listen to a complete album, it seems that each song is in a different language. “Tomer Yosef, our singer, comes from a Yemenite background and we’ve always collaborated with musicians from places like Morocco, Iran and the Balkans,” says Kaplan. Kaplan and Muskat met in New York as teenagers after emigrating from Israel and quickly began collaborating on their music, forging the eastern European and Mediterranean sounds of their background with the hip hop and dancehall beats emanating from Brooklyn’s grungy alternative scene. “This project wouldn’t sound the way it is without the American experience, the New York City experience,” says Kaplan. Balkan Beat Box’s most recent studio album, Give (2012) was inspired by protest movements across the globe – from the Arab Spring to Occupy Wall Street to social unrest in Israel. The album rallies against political ills, while providing spirit with an energetic bass-heavy track sound. It’s that balance, Kaplan says, between political expression and keeping the dance floor loose that helps drive their music. “We’re not just that political band; we’re also that crazy party, sound system band,” he says. “We talk about relationships, greed, life, whatever we want. But of course, by default, we’re also political people. Balkan Beat Box is performing on March 11 at Oxford Art Factory, 38 Oxford Street, Darlinghurst at 7pm and in Melbourne on March 12 at Prince Bandroom, 29 Fitzroy Street, St Kilda at 7pm. Bookings: wildthingpresents.oztix.com.au.